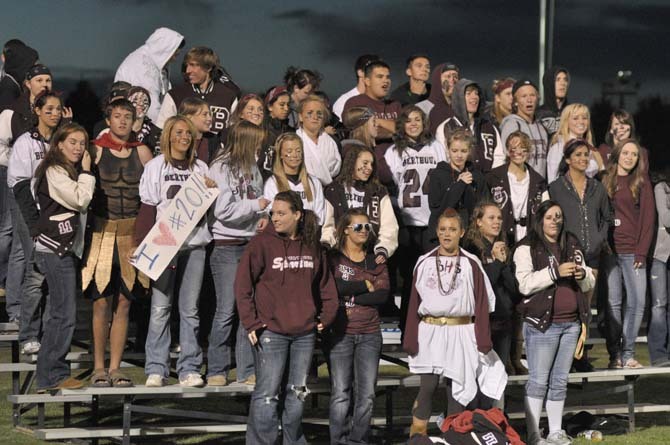 The Raptors did not give the Berthoud Spartans much to celebrate in Berthoud’s Homecoming Game. Silver Creek dominated the game and Berthoud rarely had possession in Raptor territory. The Berthoud defense stopped Silver Creek inside the 20-yard-line on several occasions, but the Raptors made most of their touchdowns on big plays. Raptor Quarterback Austin Apodaca frequently found his receivers open for big gainers while Silver Creek defenders nearly shut down Berthoud’s passing game. 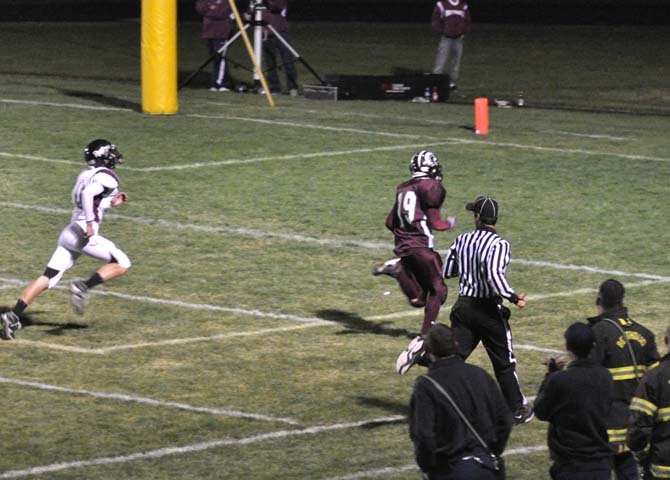 Berthoud’s only touchdown came in the fourth quarter after the Spartan defense recovered a fumble on the Raptor 46. Ruebesam then connected with Michael Nienaber on the 22-yard-line and the Berthoud speedster outran the defenders to the end zone. Still, the lopsided score did not seem to dampen the spirits of the student body as the cheer squad kept a pep rally going. Highlights of the evening were the honoring of Bradly and Diny Pickert for their contributions to the school athletic program. The Pickert’s were the major organizers who raised donation of money and material to make Max Marr Stadium a reality when the school district refused to give Berthoud a home field. At half time, the Home Coming Royalty lined up, waiting to here the student body’s selection of Homecoming King and Queen. The announcement of Logan Schuster and Katie Kouns brought cheers from crowd as the couple took a brief ride in front of the stadium seats.